Without testing the fuel pressure accurately, you cannot be sure if the lift pump in your '98.5-'02 Dodge Cummins truck has failed or if the fuel pressure gauge is reading correctly. This fuel pressure test kit is a must if you want to save time and correctly diagnose the fuel delivery problem in your truck the first time. This test kit is not designed for extended underhood use as a fuel pressure gauge. 1/8 NPT fitting for use with '98.5 - '99 24-valve trucks. On an '01-'02 Dodge CTD stock fuel system, there is a schraeder valve test port on the banjo bolt that secures the input fuel line to the injection pump. Simply remove the dust cap, and screw the test line fitting onto the schraeder valve. 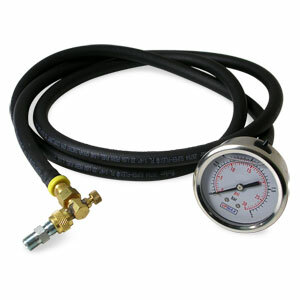 NOTE: The 6 foot fuel line included with this kit is compatible with all levels of bio-diesel fuel. NOTE: Vulcan-supplied fittings are for use on '98.5-'02 Dodge Cummins VP-44 injected engines only. First, I should say that I am relatively inexperienced when it comes to testing fuel pressure. I did have some trouble getting the Vulcan tester valve to thread onto the Schrader tightly. The travel on the tester was limited to only about 1 1/2 turns which allowed the connection to leak. I verified with Geno's support staff (both Robin & John were very responsive) that I was connecting in the correct location. I was finally able to get what appear to be decent seal by using a healthy amount of Teflon tape on the Schrader threads. I'm giving 5 Stars for Geno's staff and three stars for the tester. Even after applying the Teflon tape I wasn't completly sure I had an air tight seal (tested only 4psi fuel pressure). However, the low reading could be accurate since I still have the original lift pump. I'll be going to a shop to verify my pressure reading and look into a lift pump replacement if necessary. Worked just as expected. No problems at all. Very accurate also, I compared it with the gauge in my truck. It's a good thing the smell of diesel turns my wife on because I was covered in it after the first use. All the fittings were loose leaked all over. Once tightened up worked perfect. Needs a cap to keep test port clean. Fuel pressure test kit worked perfectly,no special fittings needed just plugged right in , highly recommend Geno's garage for all your Cummins needs! This worked well, but it leaked from each fitting on my first use. I was able to tighten those and it quit leaking. It would be nice if it came with a storage cap to install when not in use.